I’m lying on the couch with my right leg in a brace, just as I have for the past month. Every weekday morning since my knee surgery in early September, my boyfriend Kurt kisses me goodbye and heads out the door to work while I stay here, looking out a window, unable to walk. The first few days were a druggy blur of naps and Netflix, but now that the pain has subsided, each day is clear and sharp; I am fully immersed in my own anxiety and boredom. I witness our animals’ secret daytime behavior; the two cats laze and yawn like mini lions, little rulers of their own pride. The dog, like me, stares out the window, dreaming of being outside running in the sun. She jumps in excitement when she hears the dogwalker ascend our staircase, eager for her temporary parole. I don’t get to go on walks outside yet. I am still dependent on crutches, lugging my heavy brace around like a carcass. I only leave for physical therapy and doctor’s appointments; I am a captive in my own house, held hostage by my broken body, watching my right quadricep wilt away like the autumn leaves on the trees outside. Suddenly I have great sympathy for caged zoo animals, their spirits broken to fit in their confined spaces. I know the feeling. Just a few months earlier, I had been walking on two legs in Alaska. Together, with Kurt and two of our good friends, Bob and Amy, we were traveling through the state in an RV, exploring the most untamed state in the union. We spent several days camping in Denali National Park, a swath of land so untouched that there are no hiking trails beyond the park entrance; you simply jump out of the shuttle bus anywhere you want and set off into the wilderness. At the end of your day, you travel back to the one road that travels deep into the park and flag down the next bus to take you back to your campsite. We had traveled 66 miles into the park, giddily looking out windows with our binoculars. On our way in, we spotted a grizzly bear with two young cubs, a red fox stalking its prey, pika, ptarmigan, bald eagles, moose, countless Dall’s Sheep and caribou, and majestic Mt. McKinley. We signaled our bus driver to let us out near Polychrome Pass, a mountain range where the light breaks on the mountains in a prism of colors. The driver gave us a few quick tips (“When you’re in the brush, be sure to make lots of noise so you don’t startle any bears that you can’t see”) and then we we were off, 4 solitary hikers in the middle of untamed nature. Without a trail, the ground was spongy with moss and underbrush. It slowly increased from ankle-deep to thigh-high to above our waists as we hiked further and further away from the road, now just a sliver curved into a mountain in the distance. Kurt led the way, his 6’2” frame seeing the easiest over tall shrubbery. He found a knee-joint, bleached white from the sun, nestled in the grass. I wondered if we were the first human to come across it, and what kind of animal it once was. We continue to walk towards the mountain range, the bushes getting so tall that even Kurt can’t see over them. “Bear! Bear, bear, bear, bear! Don’t eat us, bear!” we sang out loud over and over again, pushing through the branches that concealed us from the world and whatever predators may be lurking nearby. Kurt reached the clearing first, a wide rocky shoulder hugging a silty creek. “There’s an animal!” he alerted us. We rushed up to right behind him and peered into the clearing. 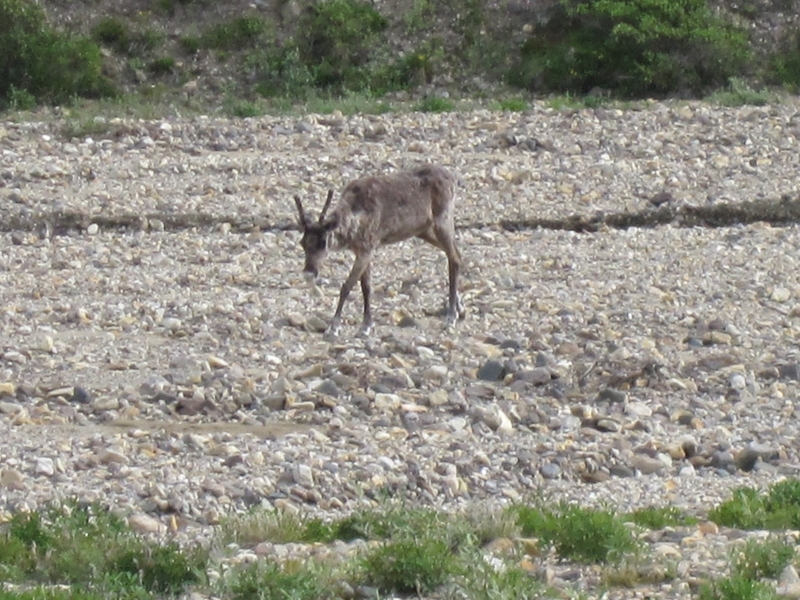 A young caribou walked along the dry river bed, only 30 yards away from where we stood. His antlers had sprouted but were small, adolescent-sized, and his coat was molting in patches, shrugging off his heavy winter layers. Since the day we entered the park, we had been bombarded with information on how to handle confrontations with wildlife. If you saw a bear, you were supposed to make loud noises, wave your arms, and retreat slowly until you put 100 yards between yourself and the animal. If you came across a moose, you were to run away immediately, weaving through trees in a zigzag pattern (and contrary to what you may think, more fatalities are caused by charging moose than by bears in Alaska.). For wolves, stamping your foot and speaking loudly in a firm voice discouraged them from investigating you further, and never run because it activates their prey drive. We could not, for the life of us, remember anything about running into a caribou. As we stared, frozen, the caribou looked right back at us. And then lowered his head, pointing his antlers at us. And. Then. Started. Walking. Towards. Us. It took a few steps and paused, as if to gauge our reaction. Though his antlers were only just coming in, they were more than anything we had on us, and we were on his turf. I suddenly felt very small, just another little animal in a very big world where unknown things prowled around the corners. The caribou must have felt similarly anxious, outnumbered and alone, as it observed us four odd-looking creatures in bright rain jackets. With a sigh of relief, we stepped into the clearing, continuing on our way. The caribou, watching us, trotted directly into our path, forcing us to stop going in that direction, so we waited and watched, letting him determine his own way first. 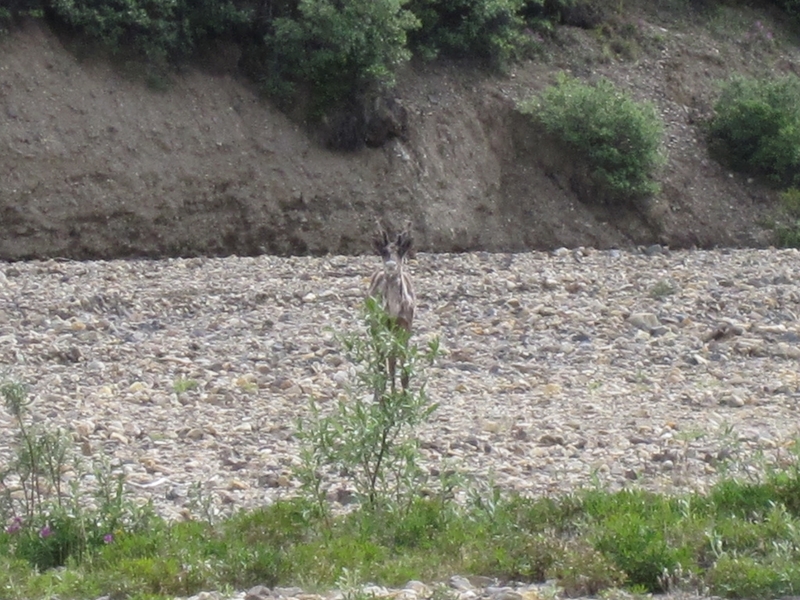 He stared back at us, and then laid down on the dry river bed, resting. We watched in silence. After a few minutes, he climbed back to his feet and continued up the river, trotting at his own pace, and eventually vanished around the bend back into his own wild, secret world. I think about that breathless, perfect moment from the confines of my living room. I lean towards the sunlight that filters through the window, feeling its warmth on my skin. Stretching across the length of my knee and shin, my scar is pink, puckered, and new. Just like my dog, I watch the birds and squirrels playing in the trees through the glass, jealous of their freedom. One squirrel leaps from one branch to another. I find myself actually envious of a rodent because it is using its little body to do what it was meant to do, muscles expanding and contracting under its fur, propelling itself from tree to tree. I can only sit here as my cells rebuild, watching the secret lives of wild animals.